After his great contribution to Sonar Kollektiv’s critically acclaimed compilation Secret Love 5 (SK196CD/folkwaves) with the beautiful song Destruction of Ourselves, Irish DJ, producer and songwriter Stee Downes brought out his long awaited debut album All in a Day (SK203CD/illicity) Jazzanova’s label in 2008. Following his debut album All in a Day, Stee Downes now presents us a remix 12" with 4 exclusive versions of his heartfelt songs. Opening this fresh remix single is Stee Downes's long friend and musical companion, Ishfaq with whom Stee also produced the album. Although also originally from Dublin, Ireland, Ishfaq is currently based in Croatia. He has previously remixed the likes of DJ Vadim and Bugs in the Attic and it's no wonder that his remix treatment of Put A Little Love In My Soul is spot on - after all he did play on and mix down the original album version. Stee Downes' lovely track What's wrong with groovin' also appeared on the recent Jazzanova compilation SK200 to mark Sonar Kollektiv's 200th release. Stee's harmonies combine seamlessly with his Fender Rhodes and a funky groove to make this a great tune for slow dancing to. London based DJ Simbad has had remixes on Brownswood Recordings, Pantone Music and BBE as well as productions work on Compost and Karen Ps ...Broadcasting on Sonar Kollektiv to name but a few. His remix of A Need For Something Else is a fine and soulful slice of minimal house, guaranteed to get the crowd moving. Winding up this fine remix 12" is Diesler with his mix of Movement. While other of Stee Downes songs have a certain melancholy, tracks don't get any more uplifting than this. It's a feel good crowd-pleaser if ever there was one. In Stee's own words: “Emotionally, I would describe All in a Day as a heart-felt and an honest expression of who I am and how I feel. The album is based around a simplistic and direct approach to melody, rhythm, emotion and message. There is an underlying bittersweet feeling to all the songs.” That holds true for this 12" too plus you have the added bonus of 4 exclusive tracks which are sure to get the party jumping. 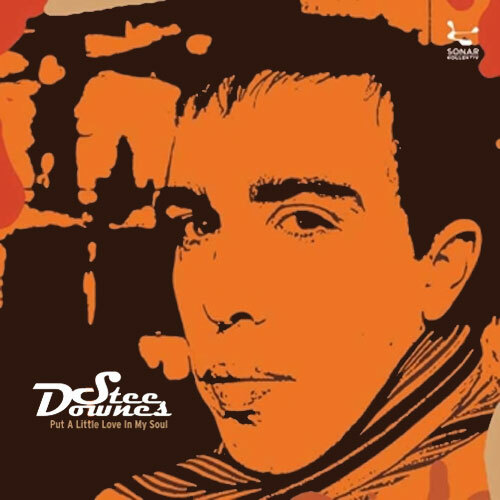 After his great contribution to Sonar Kollektiv’s critically acclaimed compilation Secret Love 5 (SK196CD/folkwaves) with the beautiful song Destruction of Ourselves, Irish DJ and producer Stee Downes is now back on Jazzanova’s label to expose his unique talents of singer and songwriter with his brilliant debut album All in a Day (SK203CD/illicity). The upcoming artist hailing from Dublin has been raised with the love of Soul music. He deeply fell in love with the music of Stevie Wonder, Roy Ayers, George Benson, and Curtis Mayfield amongst many others at a young age thanks to his parents’ record collection. This experience shaped his outlook on music and life. Artists such as Donny Hathaway, Dangelo, James Brown and Aretha Franklin took in a place in his heart and still inspire him today. Multi-instrumentalist – he plays guitar, bass, keyboard – and renowned DJ that mixes skilfully many different styles from Soul, Folk, Funk and over to Hip-hop and House music for more than 10 years, Stee is very open-minded. This ever-growing interest in other cultures got him traveling all around Europe. In 2002 after the completion of his studies Stee left Ireland’s capital-city for Amsterdam, where he started to focus his attention on writing and production. With his warm and groovy voice Stee rapidly gained recognition in the community of soulful music lovers. London based outfit Loose Ensemble got their hands on one his demo’s and promptly asked him to feature on two tracks for the Catalyst EP, which was released on Foundation records. He later collaborated with Echoplex’s Ed Eustace to be part of Vinylvibes first release, which received the massive support from top-DJs, music connoisseurs and tastemakers such as Dom Servini, Rainer Trueby, Michael Ruetten and Jazzanova. Inspired by the positive reaction Stee was determined to keep on pushing. He developed his vocal talents and combined them with his original song-writing to create a unique sound. He began to build his repertoire and put together a live show, later supporting top acts such as Amp Diffler, Bugz in the Attic and Money Mark in 2006. In April 2008 he teamed up with old friend and musical counterpart Ishfaq to record his debut album All in a Day (SK203CD/illicity). They settled into their makeshift studio in Croatia and recorded the album in two weeks. Coming from the same school of thought and heavily influenced by similar music they formed a solid partnership and played all the instruments on the project. The songs on the album are a collection of thoughts, observations and experience. His creativity is driven by his personal feelings and by his philosophy of always being honest and true to himself. As Stee puts it: “Emotionally, I would describe All in a Day as a heart-felt and an honest expression of who I am and how I feel. The album is based around a simplistic and direct approach to melody, rhythm, emotion and message. There is an underlying bittersweet feeling to all the songs.” In ten songs that fuse the emotion of Soul and the groove of Funk with the coolness of Jazz, Stee Downes opens his hearts and gives it all to you. With his laidback and soulful voice Stee will relax you at once. All in a Day features Stee Downes' excellent and first single Asunder (DK031/illicity), chill-out and feel-good tunes such as When I’m Feeling, What’s wrong with Groovin’, funky and groovy numbers such as Disciples and Movements, as well as deeper and more intimate songs like Put A Little Love In My Soul, Obviously and Destruction of Ourselves. If you are feeling down, All in a Day (SK203CD/illicity) will help you releasing stress and anxiety and if you feel good, the music of Stee will make you smile even more! All in a Day is the best cure to soothe your mind and refresh your soul, give it a listen and let Stee Downes take you on board for a relaxing and soulful cruise. Очень приятный голос у этого юноши с пухленькими губами. Дебютный альбом и винил с ремиксами вышли на Sonar Kollektive, заведуют которым Jazzanova, чью дискографию обязательно выложу через пару промежутков времени.